LEXINGTON, Ky. (Jan. 30, 2019) — University of Kentucky MBA alumni from Valvoline, Alltech, UK Healthcare and AMR Management Services will be featured at the Gatton College of Business and Economics' One Year MBA Open House event beginning 5:30 p.m. Thursday, Feb. 7. The One Year MBA program is open to all students, majors, young professionals and recent graduates. This stellar professional panel will include Matthew Jones, director of strategic accounts at Valvoline; Pooja Talauliker, EPMO senior project manager at UK Healthcare; Saman Rahimi, global supply chain specialist at Alltech; and Rachel Dudney, director of business solutions and innovation at AMR Management Services. Matthew Jones has been with Valvoline for almost eight years in various leadership positions including territory brand manager, brand manager and his current role as the director of strategic accounts. Jones received his MBA and bachelor's degree in managerial economics from UK along with a minor in Spanish from the Universidad de Cantabria. "Obtaining an MBA from Gatton, especially early on in a career, sets you apart from individuals and positions you higher in consideration for new opportunities," Jones said. "An MBA gave me the assets and guidance for a career path that aligned with my goals, as well as a broad background in cross-functional business areas, which prepared me very well for the private sector." Originally from Iran, Saman Rahimi is a recent UK MBA graduate. Rahimi has been with Alltech for almost three years and has advanced from marketing intern to senior global supply chain specialist. He received his bachelor's degree in agricultural economics from the University of Kurdistan, Sanandaj, and holds another master's degree in agricultural economics and marketing from the University of Tehran. "The UK MBA helped me extend my professional network among various industries along with my classmates, who will be societal leaders in the coming years," Rahimi said. "The Graham Office of Career Management at Gatton played a significant role in my career success." Before joining UK Healthcare in her current role as EPMO senior project manager, Pooja Talauliker was at Catalent Pharma Solutions for almost seven years as a project manager, ERP deployment lead and senior project manager. She received her MBA from UK, and her doctorate in anatomy and neurobiology from UK's College of Medicine. Talauliker was also a biotechnology and biochemical engineering undergraduate from the Indian Institute of Technology Kharagpur. She said, "The One Year MBA program, along with the Project Connect internship, helped me gain the skills required to make the career transition from research to health care management. The program was everything I expected it to be, which was an opportunity to increase my knowledge base and expand my professional network in a supportive environment." Rachel Dudney graduated last year from the One Year MBA program and had two and a half years of professional experience from Amazon working as an area manager. During her One Year MBA program, Dudney participated in the Project Connect internship with GE Appliances, a Haier Company. After graduating from the UK MBA program, she joined AMR Management Services as their director of business solutions and innovation. 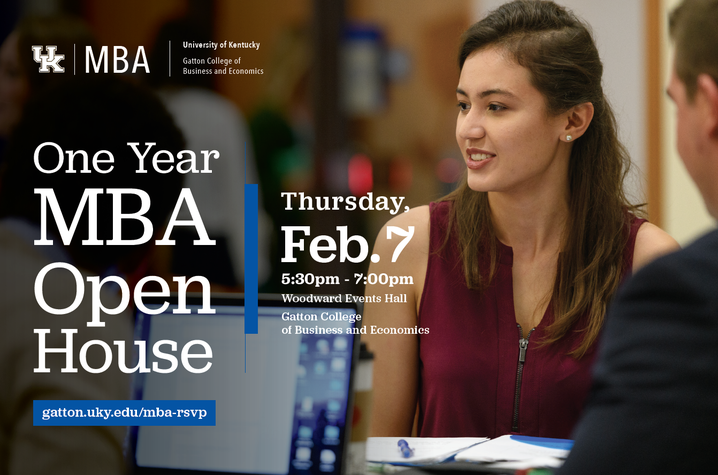 The One Year MBA Open House at UK provides an opportunity for community members to find out more about Gatton’s One Year MBA and dual degree programs. For more information, please contact Christopher T. Carney, director of MBA recruitment at the Gatton College of Business and Economics. Event registration can be found at http://gatton.uky.edu/mba-rsvp.